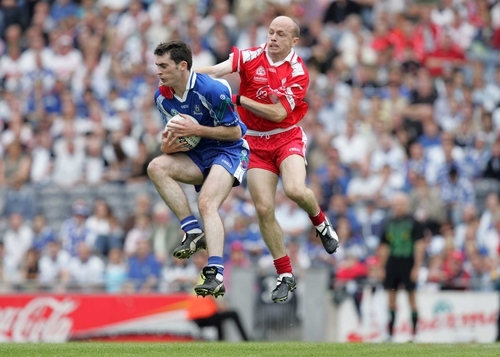 Monaghan eventually succumbed to tiredness and allowed Tyrone run up a flattering 2-14 to 1-07 score-line which failed to illustrate how much of a fright Mickey Harte's men had been given in the first half of this Bank of Ireland football qualifier at Croke Park today. The Farney men led by six points at one stage, but finally succumbed to the Red Hands' power and experience. Stephen O'Neill hit 2-6 to cap a superb personal performance, and Sean Cavanagh returned to his brilliant best with a storming second half performance from midfield. Tyrone will now meet the Dubs but, by their own admission, they will have to improve for next weekend's quarter-final clash. Monaghan stunned Tyrone with a ferocious opening which saw them run fearlessly at the Red Hand defence, early points from Rory Woods and Hugh McElroy settling the nerves and giving them confidence. By the 12th minute they were 0-4 to 0-1 ahead, Tommy Freeman having added a super point. Croke Park went wild two minutes later when Freeman cut in front the right to fire in a glorious goal. When Paul Finlay landed his second free of the contest, Seamus McEnaney's men led by 1-5 to 0-2 and a sensation was in the making. But Tyrone recovered from their early nerves and gradually clawed their way back. Two Stephen O'Neill points and an Owen Mulligan free narrowed the gap and, on the half hour, Mulligan sent O'Neill in for a well taken goal to level the game. It was Monaghan, however, who eased ahead again through McElroy to lead by 1-6 to 1-5 at the break. Tyrone introduced Peter Canavan at half-time but it was O'Neill and Ryan Mellon who got them in front, Canavan denied a goal by the reflexes of Shane Duffy. A Canavan free made it 1-9 to 1-7 at the end of the third quarter and Monaghan hopes suffered a setback when skipper Damien Freeman picked up a second yellow card with 10 minutes to play. It was one-way traffic and in no way representative of what had been a competitive and well-contested match until then. O'Neill brought his tally to 2-6 when he palmed home Brian McGuigan's cross in the 65th minute to well and truly bury a brave Monaghan. Tyrone: P McConnell, J McMahon, C Lawn, S Sweeney, D Harte (0-1), G Devlin, P Jordan, C Gormley (0-1), S Cavanagh (0-1), B Dooher, B McGuigan, O Mulligan, R Mellon (0-1), S O'Neill (2-6, 5 frees), E McGinley. Monaghan: S Duffy, D McArdle, J Coyle, C Flanagan, D Freeman, V Corey, G McQuaid, D Clerkin, E Lennon, J McElroy, P Finlay (0-2, 2 frees), R Woods (0-1), T Freeman (1-1), H McElroy (0-3, 3 frees), S Gollogly.